Store your treasures and important documents in a Safe Deposit Box at ONB. We have 5 different size boxes to choose from for your content needs. Only available at our Main Office location. Call or stop into talk with a Personal Banker for more information. Opt for a bank safe over a home safe. While home safes can cost as little as $99, they’re much easier for thieves to crack. Most home safes weight less than 100 lbs., so it’s not that difficult for thieves to walk off with your safe — and your valuables. That’s not going to happen with a bank safe, which is both heavily guarded, securely constructed, and monitored 24/7/365. Don’t confuse FDIC rules with safe deposit boxes. If you do opt for a safe deposit box, know that your assets inside the box are not covered by FDIC bank insurance deposit rules. What you can do to insure your valuables is attach a rider (known as a Personal Articles Floater) to your homeowner’s policy. If you think you don’t need insurance, just ask New Orleans bank safe customers after Hurricane Katrina hit in 2005. Police estimate that more than 250 banks and home safe vaults were flooded. Go ahead and stash important papers — but make copies. Deeds, car titles, family birth records, stock certificates and wills and trusts may seem like good candidates to go into a safe deposit box. That’s true, but if it’s the only copy of the document you’ll want to make a copy in case the unexpected happens. 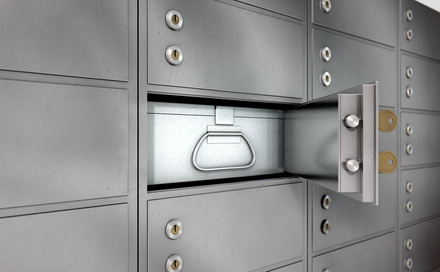 Tell your insurance company you use a safe deposit box — you could get a price break. Many insurance companies will offer lower premiums on your valuables if you use a safe deposit box. But you have to ask.